The Nintendo Switch has been a hot topic of fans, critics and skeptics alike the past few days since the reveal conference in Tokyo. Many fans are gung-ho and excited to see what all they can do with their newest console to add to the collection from Nintendo while many fear that this is too little, too late. Many are simply waiting to see more details on games to be the core component that swings them one way or another. However, if they’re a Mario Kart fan, some of that news may not be the most enlightening of information. Mario Kart 8 Deluxe for the Nintendo Switch isn’t going to be launching just how fans may have hoped. 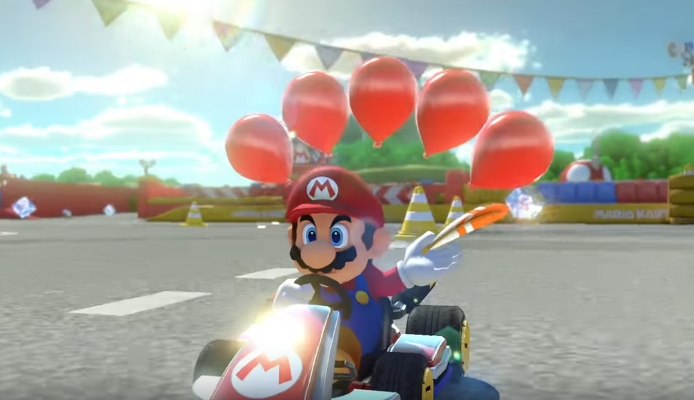 In a livestream showcasing gameplay and first-party titles to the Switch, Mario Kart 8 Deluxe was up on the chopping block for the world to see on the Switch. Of course, with it being such a prominent title within the Nintendo family, the hype was there for a little bit. However, the dismay kicks in around the 6:10 mark of the video seen above. If fans were hoping for more and an extension of that of what they loved from the Wii U version of the game, they may not be too happy to find out that Nintendo executives confirmed that the game will feature a total of 48 tracks in the game. For those wondering, that is the same amount that the Wii U has when you add in the base game and DLC tracks. A number of rumors speculated that we’d end up seeing more for Mario Kart 8 Deluxe, especially since the base game has been around on the Wii U since May of 2014. There is a very few number of new features such as the returning double item box from Mario Kart: Double Dash and additionally there will be three new vehicles in game along with characters, but in the grand scheme of things, does a general total of 10 new items in the game really deserve the title of Deluxe? This has prompted many of the die-hards in the community to question where the supposed 16 new tracks went with a refuting argument that the Deluxe title and the maps in question simply referring to the DLC maps that came post launch with Mario Kart 8 but many have had this game add to their distaste and dissatisfaction with the Switch thus far. With many titles not being offered at launch and many not fully optimized and not fully redone (we’re looking at you Skyrim… not even remastered), many fans feel like they’re just going to be paying for games they could have elsewhere or that they’ll have to wait to simply be able to play the new console they want to. It certainly is interesting to look at the amount of title post launch of the Switch and we’re all pulling for them all to do well. Time will be the determinant within the situation however that will show just whether releasing it earlier on was the right move or not. Regardless of that outcome, it doesn’t change the fact of what Mario Kart 8 Deluxe will be releasing with. The topic is certainly one that can be regarded with skepticism but until we get our hands on the game, we won’t know if it’s worth getting worried about or not. While Mario Kart 8 Deluxe is not out until April 28th, we’ll have roughly a month to adjust to the Switch and wait in anticipation for the newest way to race our beloved characters.